A visit to the Swiss Garden takes you back to the early 19th century, when an interest in ornamental gardening and picturesque architecture were first combined. The Swiss Garden is a unique and beautiful example from one of the great periods of English gardening. 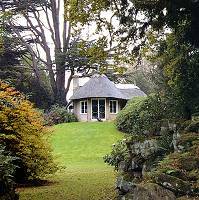 Within just 10 acres you can wander among splendid shrubs and rare trees, at the centre of which is the tiny romantic Swiss Cottage. There are many other exotic structures. Hidden nearby is a breathtaking Fernery and Grotto, full of dazzling light and mysterious darkness. Ticket sales and entrance to the garden are from Old Warden Park visitor centre (adjacent to Shuttleworth Collection). On event days, ticket sales and entrance to the garden is from the garden pay kiosk (southern side of garden). Visitors are welcome to walk their dogs in nearby woodland but not in the Swiss Garden. Please use the bins provided, all dogs must be kept on a lead while in Old Warden Park. Access via Old Warden Park entrance in Old Warden village. Please follow the signs from A1 or A600. Trains from Peterborough or London King's Cross stop at Biggleswade 3 miles away. Local services are infrequent, please telephone for information.